Why the label of bottles have been changed? In view of r.-idf-bar was set to Restricted on October 23, 2007 , I was forced to edit my other beach furnitures to meet the new General Audience Criteria, either remove the bottles (in the LiVilla) or add new label to the bottle (in the Terrace Pool, the Bar and the Dining Table). Why change the label of bottles instead of removing the bottles? To meet the new General Audience criteria, those bottles in the bar have been “label” with mango juice. YES!! The bar will ONLY provide mango juice. Sorry, no alcoholic beverages are provided here. I have added a new Material M10 (10_bottle_label.xrf) to the mesh. Kindly change the texture with your version of label (any drink except alcoholic beverages) to meet the General Audience criteria! Kindly report any bug you found. Thanks! To meet the new General Audience criteria, those built in pool-bars has been modified to become juice-bars by replacing the label of wine bottle with red grape juice label. This version of TerracePool will provide three type of juices – 100% orange juice, red grape juice and dragon fruit juice. All set meals included free red grape juice. Sorry, no more alcoholic beverages are provided here. Kindly replaced the texture of Material M30 (30_wine_label.xrf) with new label of any drink except alcoholic beverages to meet the General Audience criteria! LiVilla has been updated to version 2.0 on October 23, 2007. All bottles and wine glasses in LiVilla had been removed to meet the General Audience criteria. Please report any bug you found. Thank you very much! The budget “bar” has been “Restricted” !! 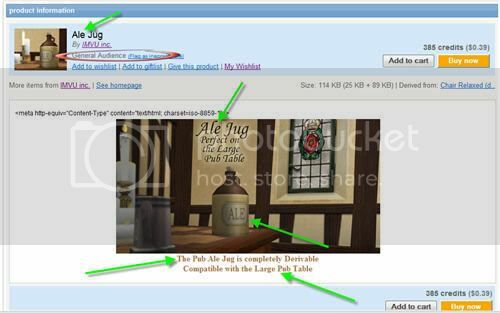 Unfortunately, an IMVU user has complained that r.-idf-bar was inappropriately rated because of INAPPROPRIATE CONTENT—Alcohol Use and Reference (APO) – Reference to and/or images of alcoholic beverages. This is why r.-idf-bar had its rating set to Restricted by an IMVU administrator on October 23, 2007!! However, All the bottles in this product are not labeled with any image indicating “wine” or “beer”. So, I’m very sad regarding the action of IMVU. It also forced me to edit my other beach furnitures to meet the new General Audience Criteria. If you don’t have access pass, please wait IMVU to refund to you. If you don’t receive the refund, you may send your complain to IMVU staff at imvurefunds@imvu.com.